...but not really, because it's new. Apparently the pleated red dress, jacket, and hat worn when the couple made their introductory visit to Germany in 2014 weren't enough to fill the "folded effects/red division" portion of the royal wardrobe, because now we have a slightly darker and slightly simpler red dress with similar details hat. The dress detailing is confined to just one side of the skirrt, which is both an interesting detail and possibly not an interesting enough detail for a fairly basic outfit. The primary point of interest can't be seen on the above photo, I'm afraid (click here for a gallery, though, or here for a video). Floral shoes! They are (per ModeKoninginMathilde) from Dior, but instead of the green version above, they are pink/red. And they are possibly the best pair of shoes Mathilde's ever worn. WANT. Oh, and P.S. : Look, Ma! Heels and no crutches! Queen Robocop has left the building. 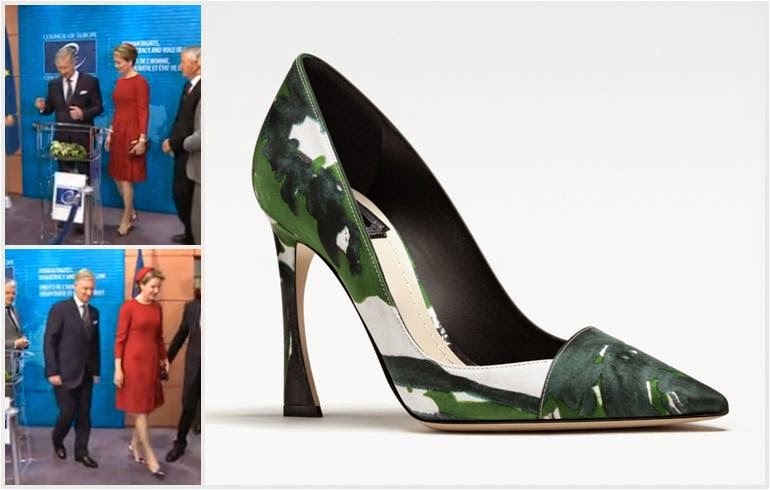 Since we're on Red Queens from Benelux Countries - Mathilde has her specific wardrobe sections, we have our specific coverage sections - Queen Máxima headed from Denmark to Washington, D.C. last week as part of her work in financial inclusion. She repeated a red Natan frock that I thought was a hit originally, and I think is a hit on the second go too. Who knew talking about finance was such a kick, huh?